The ALZO Smoothy Radius and Linear Camera Slider is an excellent tool for interview and B-Roll video, adding talent-stationary camera motion; it is also very useful for 'A' camera in commercial product presentations. The slider has a 40 inch run and can replace time-consuming track and dolly for many shots. This slider easily converts from curved radius to linear sliding by simply changing the track attachment to the base beam. Constructed from a lightweight, yet rigid aluminum track that mounts to a base beam with thumb screws in either curved or straight while stainless steel nylon wrapped bearings assure an ultra-smooth action and very long life. 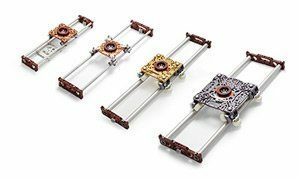 The slider camera bed allows for 1/4 inch x 20 or 3/8 inch x 16 thread mounting of camera quick releases plates; with the exception of the basic model, a camera quick release is included. For best results, they recommend using a Pro video tripod with a load capacity over 5 pounds, like the ALZO Pro-Pod V. Another support option is to use 2 light stands screwed into the ends of the slider, which is the most stable slider mount. For the ultimate lightweight and rigid camera sliding, we recommend adding the ALZO Camera Slider Brace Support to a tripod. The slider can also be placed on a table or any flat surface by adding the ALZO Slider Table Leg Set accessory (see image); this is a stable solution, but height adjustment is more difficult. The load capacity for the Smoothy Slider is up to 3 pounds of camera weight. The center tripod mount includes 1/4 inch x 20 and 3/8 inch x 16 threaded mounting holes. In addition, the base beam ends include 1/4 inch x 20 and 3/8 inch x 16 threaded mounting holes on the bottom. These mounting holes allow for attaching the ALZO Camera Slider Brace Support.